I recently started following Dr. Taylor Marshall’s blog, Canterbury Tales. He’s a former Episcopalian priest but now a happily and fruitfully married layman in the Catholic Church with a beautiful family of 7 kids, including their newest. He’s also the Chancellor of Fisher More College nearby. Oh, and he’s an Aggie, class of 2002. WHOOP! He recently announced that he would be releasing a 50-page book on St. Thomas Aquinas for free, but only for people who signs up for his email newsletter. I couldn’t resist in the offer for simple reasons… A) free B) I don’t know much about St. Thomas Aquinas C) ebook, because my physical Catholic bookshelf is overflowing and D) free. It took me a week to read it because I’m terrible at finding time to read (nevermind that it’s taken me a year and a half to be 75% through Inheritance, the last book about Eragon…(but hey! I’ve read like 5 Catholic books in that time…)). 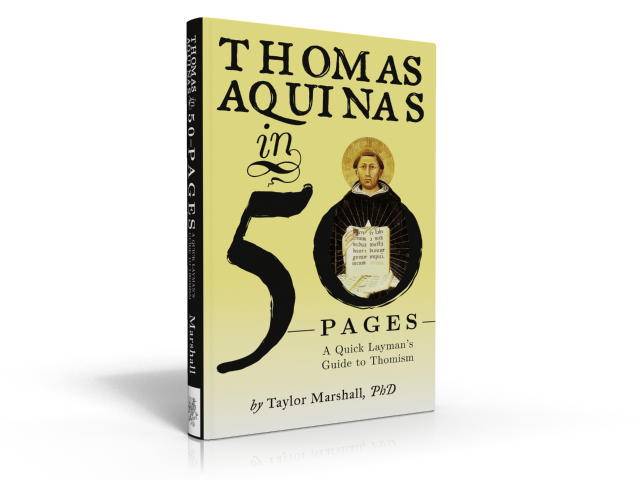 But thank goodness it was 50 pages because my first mistake in trying to learn St. Thomas Aquinas was purchasing his Summa Theologica for my Kindle app and feeling rather intimidated by it. Dr. Marshall provides a brief bio on Aquinas and succinctly illustrates his mindset and way of thinking. He also makes a distinction between philosophy and theology through the mind of Aquinas. I think the most useful thing I learned were the “4 Causes”: formal, material, efficient, and final. An example would be a blog post. The formal cause of a blog post is the idea of what to write about. The material cause would be an Internet connection and a keyboard. The efficient cause of a blog post would be me writing the blog post. And the final cause of a blog post is for me to share something about me and Catholicness. After learning about Aquinas and the way he thinks, Dr. Marshall then presents Thomistic proofs and thoughts about God, angels, humans, virtues, and natural law. All in all, I think this was a great way to begin learning about one of our Angelic Doctors and great saints. Now, with a little more background and getting a feel for how he thinks, I think his Summa will be a little easier to understand.